Virginia | Stop Dog Whistle Racism! 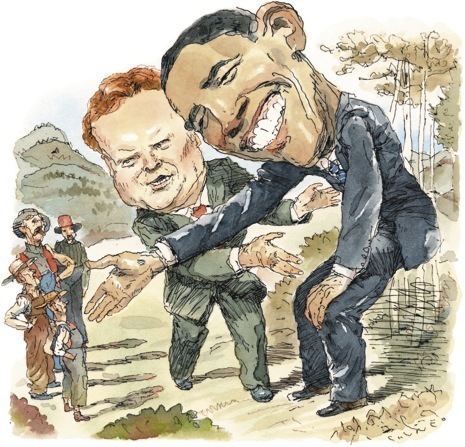 The caption to this illustration in The New Yorker back on the 12th (accompanying the article, “The Appalachian Problem,”) read: Will Jim Webb’s Scots-Irish populism work for Obama in the hill country? The Obama of the campaign trail is at once more prosaic and perhaps more proficient. If you sidestep Mr. Powell’s racist allusions to Obama as a black charmer, a political Miles Davis playing through a mute to effect just the right strains for his white rural audience, and you can get beyond the harsh description of Obama “backstroking in the regional accent pool,” what emerges is the answer to the question. Besides, if the bridging and representing implied in this image was all Webb’s doing, the same “coming around” wouldn’t be happening now across rural America. I just watched the video of George Allen’s infamous macaca gaffebecause something a McCain campaign adviser said Saturday reminded me of it. Nancy Pfotenhauer, the adviser, told MSNBC that she was certain John McCain would triumph in Virginia — he’s trailing in the polls — because of his support in “real Virginia,” by which she apparently meant those areas far removed from Virginia’s urban areas, where Obama is expected to do well. Allen, of course, lost to Jim Webb — largely because of overwhelming support for Webb in northern Virginia. Had Allen won, some think he might have been the Republican presidential nominee today. Maybe he’d be pushing for the votes of “pro-America” Americans. Nashville Post Politics: Is Virginia Ready For A Black President? Is Virginia Ready For A Black President?